Rather than wait for the next round of negotiations, it is imperative that governments and international bodies continue to pressure the Syrian regime. Hussein Malla/AP/Press Association Images. All rights reserved.Five years into the Syrian conflict, the increasing number of victims is almost mind-numbing, with over 400,000 killed and over 10 million displaced. Yet there is another group of victims whose plight is often overlooked: those who are being detained, tortured, and disappeared in Syria’s prisons. Arbitrary detention and torture are not new in Syria; tens of thousands of political dissidents were held, brutalised, and executed during Hafez Al-Assad’s rule from 1971 to 2000, including at the notorious Tadmur Prison, and some 17,000 were disappeared. In the current conflict, the use of mass arrests, torture, and sanctioned killing has only escalated. Numbers vary, with the Syrian Network for Human Rights recording 117,000 cases of arrest and detention between 2011 and 2015 but estimating at least 100,000 more undocumented cases, and the Syrian Observatory for Human Rights estimating close to 500,000 cases. In the majority of cases, the families of the detained and disappeared have no information on what happened to them. The Observatory further reported the deaths of at least 60,000 people in government jails since the start of the conflict, including over 100 children, from torture, execution, or denial of food or medicine. Over a third of prisoner deaths were documented at the Sednaya Prison near Damascus, but abuses amounting to war crimes and crimes against humanity have been widespread across 27 identified detention centres. The extent of the regime’s use of torture and execution was visually confirmed in 2015 through the analysis of over 50,000 images smuggled out of Syria by a defector code-named 'Caesar'. A former forensic photographer for Syria’s military police, Caesar and his colleagues were tasked with creating a photographic record of those who died in detention as part of a grim bureaucratic documentation effort on the part of the security apparatus. With great risks to themselves, Caesar and his associates decided to smuggle out digital copies of the images with the dual aim of letting victims’ families know what had happened to them, and letting the world see the extent of the Assad regime’s abuses. Now known as ‘Caesar’s photos,’ the images evidencing widespread torture, starvation, and execution, were eventually delivered to Human Rights Watch, where, despite the Syrian government’s denials, they were verified in coordination with Physicians for Human Rights and independent analysts. The photographs have since been shared with the United Nations Human Rights Council, the European Union and United States Congress. Selected images have also been on public display at the UN Headquarters in New York and the US Holocaust Memorial Museum in Washington, DC, and online via HRW’s report, If the Dead Could Speak. 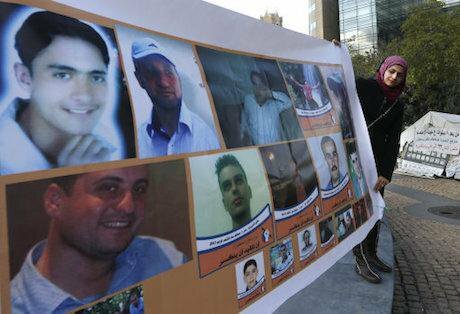 Soon after the photos’ release, a UN report concluded that the extent of the regime’s killing of detainees amounts to ‘extermination’ of the civilian population and constitutes a crime against humanity. Likewise, local and international human rights groups have sought to bring more attention to the issue of detention and torture in Syria, and the solidarity group Detainees First emerged in June with social media campaigns and a public protest in Paris. Meanwhile, detainees have taken action to directly challenge the regime. In May, a week-long prisoners' revolt broke out in Hama prison in response to the government’s attempt to forcibly transfer some detainees to Sednaya, the prison known as the primary site for prisoner deaths and executions. In clashes with government forces, prisoners took the warden and several guards captive before a deal was struck that saw the release of 83 prisoners held without charge. A similar uprising occurred several weeks later. However, the regime has also doubled down. According to the Syrian Network for Human Rights’ monthly reports, cases of arbitrary arrest have only increased in recent months, with at least 517 arrests April, 741 in May, and 843 in June. Furthermore, in the rare cases when prisoners were released, Reuters reported that they were freed on condition that they would join the army upon their release, and most likely be placed on the front line against ISIS. Previous attempts at broader negotiations regarding the Syrian conflict have included detention as a focal issue; one of the limited outcomes of the last round of failed peace talks was the appointment of Eva Svoboda, formerly of the International Committee of the Red Cross (ICRC), as a UN coordinator for detained and disappeared persons in Syria. It is likely that the issue of detention will be central in any future efforts as well. Recognizing that some armed rebel groups, like the regime, use arbitrary detention, torture, and execution, international diplomats have suggested that mutual prisoner releases might be a confidence-building measure for future talks. However, all past attempts at negotiations have failed, and few are optimistic that the parties will return to the table any time soon. Meanwhile, the arrests and torture continue. Rather than waiting for the next round of negotiations, it is imperative that governments and international bodies continue to pressure the Syrian regime on this issue.